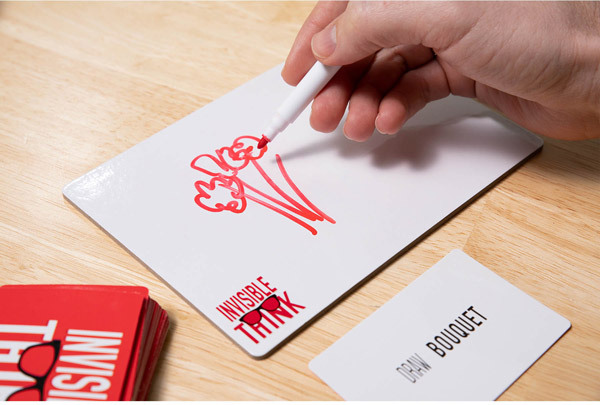 Invisible Think: Challenging Pictionary-like game played with invisible ink. Quick! Draw a banjo and try to get someone to guess what it is. Oh, and you can’t see what you’re drawing. Oh, and the guessers can’t see what you’re drawing. Oh, and if they guess “guitar”, you all lose. Great, you just made it past the first round of Invisible Think! 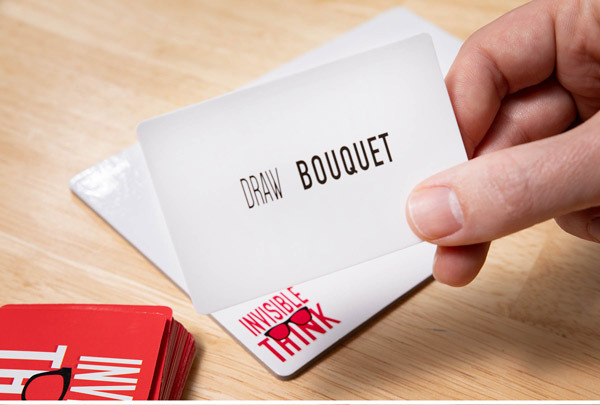 Invisible Think is a game that pairs drawing skills with a pair of glasses that make those drawing skills disappear. Flick the spinner to find out if the person drawing, the guesser, or everyone will have to wear the special optics that make the red ink invisible; then pick a card that will tell you what to draw. Be careful though, as some cards have a forbidden word that, if guessed, will cost your team the round. The first team to correctly guess six drawings will celebrate victory while the losing team will be seeing red. When you’re seeing red in Invisible Think, it doesn’t mean you’re mad; you're just throwing out madcap guesses. 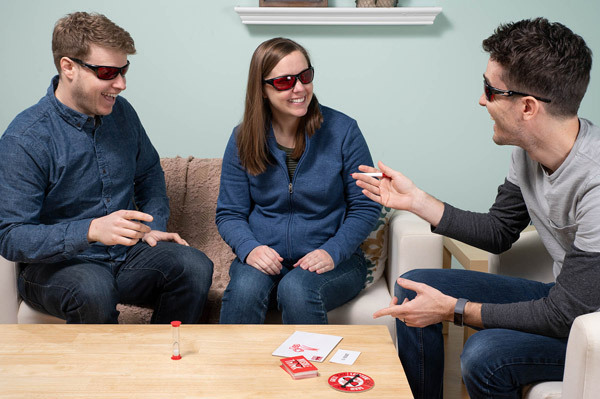 When you don the red glasses included in this game to watch someone draw with a red marker, their line art disappears, so you'll have to watch them conduct a picture symphony to understand what they're doodling. Since those not wearing the glasses have an uninhibited view, your wild guesses will have your compatriots howling with laughter. The glasses turn the marker invisible! 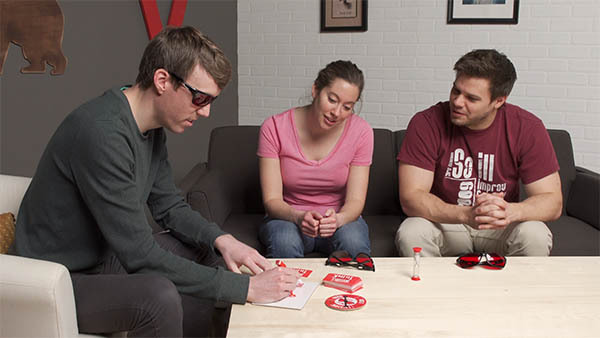 In this party game, the lines that you and your friends draw disappear, but it's not due to some chemical process. 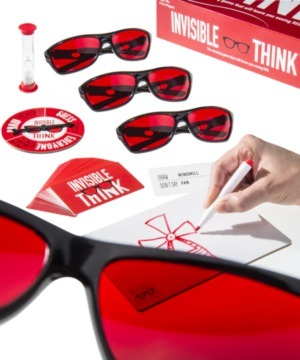 Instead, they only appear to disappear when you put on the red-tinted glasses. The illusion makes you think that the drawer isn't making any lines at all, but to anyone without glasses, their marks are plainly printed. 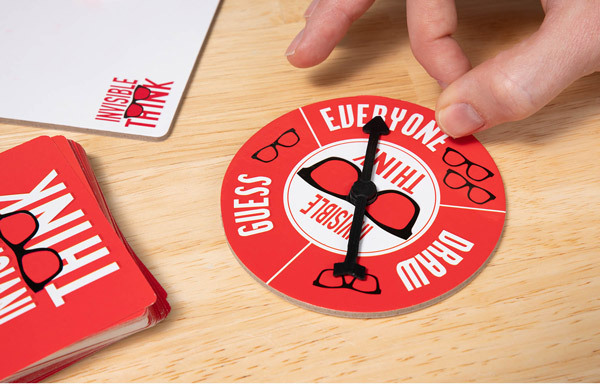 To play Invisible Think, first, spin the wheel to determine who will wear glasses; it could be the drawer, the guesser, or even both! 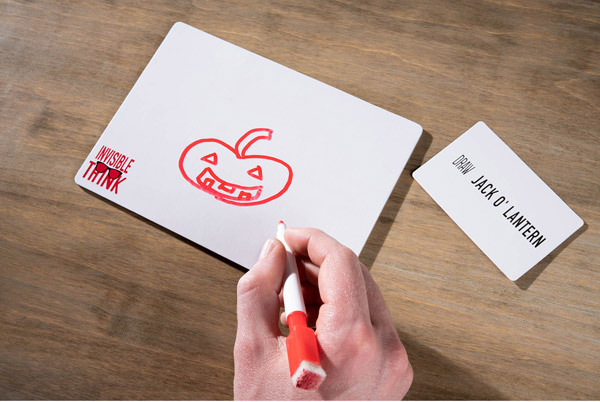 Then pick a card and draw the thing described on that card. The invisible illustrator can only offer visual clues… no talking allowed. Their team can shout out as many guesses as time will allow, so keep 'em coming. If your team manages to guess the word, you score! Spin, shades, select, sketch, surmise… success! To keep your gameplay red-hot, there are two types of cards. 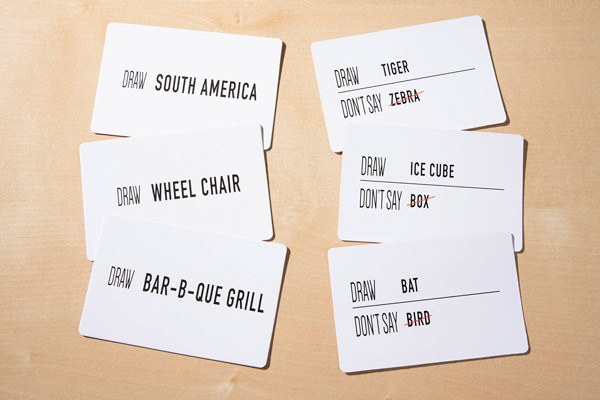 Every single card in the deck has a word or phrase for you to draw. But some of the cards also have a second forbidden word. If your team speaks the forbidden word, the round is immediately forfeit, so you'll have to think hard and figure out how to draw around the limitation. Don't say the forbidden word! The friends provided in the box are truly invisible, so you'll want to gather up your own. 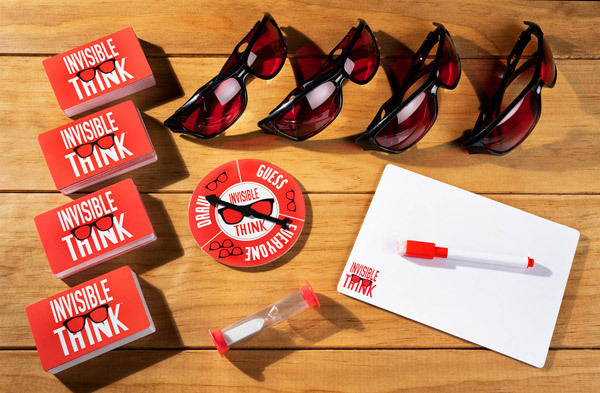 Everything else you need is in the box, including 220 cards, a spinner, a timer, 4 pairs of red glasses, a dry-erase board, and a marker. Question: Can I use any old red marker? 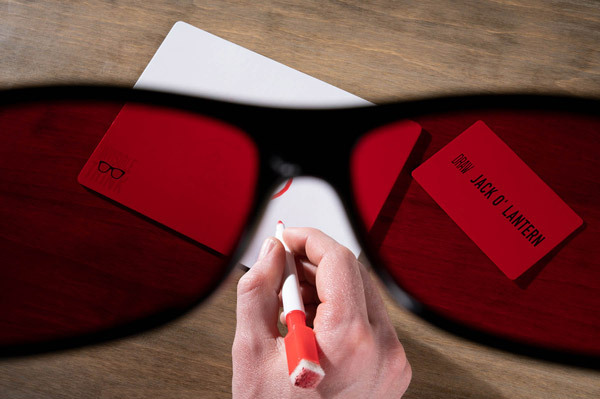 Answer: As long as it's a dry-erase marker (so that you can reuse the drawing board) and the same shade of red (to be blocked out by the glasses), another red marker should work just fine. 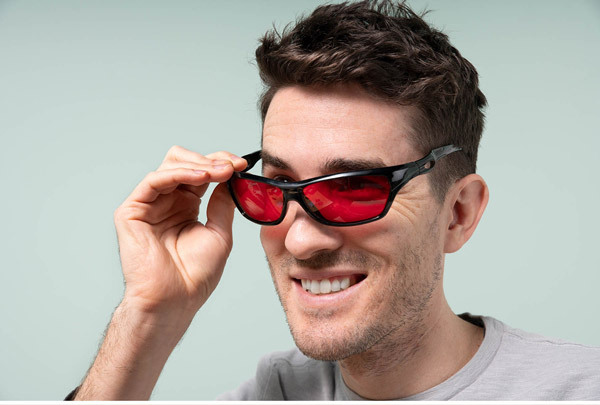 Question: Can I wear the filter glasses on top of my normal glasses that I need to see? Answer: The filter glasses are a wrap-around style that fits pretty snugly, so we can't guarantee that would work.